Careers Cost > How Much Does a Shopping Cart Cost? How Much Does a Shopping Cart Cost? A grocery cart, often referred to as a shopping basket or trolley car in the U.K., is a common staple found in grocery stores across the world, can provide a customer with convenience while shopping. No matter how many items you’re purchasing, the grocery cart, as you probably already know, allows you to carry and transport these items easily throughout the store. The cost of a shopping cart will depend on the size, materials it’s made from, the company producing it and where the shopping carts are purchased from. On average, shopping carts can cost anywhere from $90 to as much as $200 per cart. If the cart were to implement technology that locks the wheel of the cart once it goes outside of the perimeter, then the costs can often double. According to Wikipedia, the average cart can cost $75 to $150, and shopping cart theft is estimated to be in the $800 million range annually. This LA Times article says grocery stores lose 12 percent of its carts every year, and to replace one, it can cost an average of $75 to $125 for retailers such as Walmart. A smaller liquor store shopping cart, for instance, can be purchased for $150 to $175, while a unique double basket cart can cost $120 to $175. A medium or large sized shopping cart, the cart you commonly see at a grocery store, can cost $120 to $195. For example, the Carriage Trade Service Company sells shopping carts that can be purchased in bulk. Here, according to their website, small plastic shopping carts of varying styles and sizes are sold for anywhere from $120 to $150 per piece. For a medium to large size plastic shopping cart, the cost would be $165 to $173 per cart. WebstaurantStore.com, another online retailer, only sells one kind of shopping cart for about $100. NOTE: Most of the retailers we looked at did offer a bulk discount of up to 10-20 percent if you were to purchase more than 10 at once. 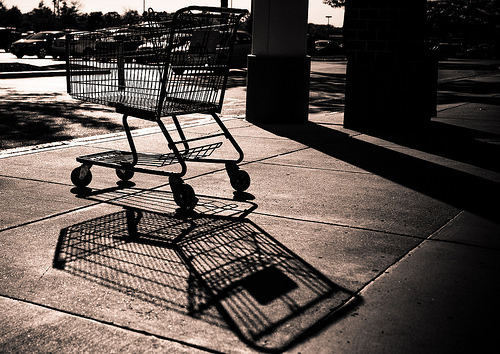 Shopping carts can be made of metal, plastic, or can be a combination of the two. A shopping cart consists of several parts. This includes the main body in which the bulk of the items can be placed. Some of them even have a small foldable basket in case customers would like to separate certain types of grocery items or even allow a small child to sit. Most importantly, shopping carts have four wheels, with two that swivel in the front, making it easy for them to be pushed around. Most companies also offer a warranty for the shopping carts that they sell. For a certain period, the product will be covered for any damage that may occur, usually up to a year. Shopping carts can get broken due to extensive use, leading to either a service fee or additional charges for a new one. For personalization and branding, shopping parts can also have logos installed on them. Why is the cart so expensive? According to this Science Channel video, it’s due to the 75 yards of galvanized steel covered in Teflon that’s able to withstand crashes up to 30 miles per hour. Buying bulk often brings the price down per cart. There are used shopping carts for sale which can cut the price of the item by more than half in some circumstances. These used shopping carts can be found on Craigslist, going out of business sales or local classified ads. Larger stores may be able to offset the costs by allowing local advertising on the cart.